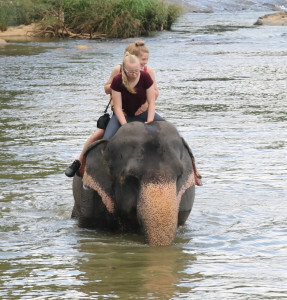 The last few days have been mostly spent playing the part of tourists – as you can see from the photos this has involved doing some of the things that Sri Lanka is most famous for: riding elephants and climbing Sigiriya (Lion Rock). These things are emblematic for the country – most t-shirts have a picture of an elephant on them and the lion is proudy displayed on the national flag. 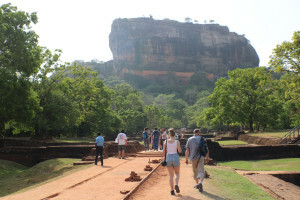 A lot of the history in the cultural triangle harks back to periods of great Sri Lankan dynasties – be it the 5th century AD when Kassapa created the sophisticated architectural marvel of Sigiriya or the kingdom that flourished at Polonnaruwa in the 11th-13th centuries. It is great to see when people take pride in their past. It can create a distance between nations though. The first thing a foreign tourist notices is that they are, well, foreign. All tourism hotspots have prices (and usually separate entrances) for ‘foreigners only’ – the prices are usually 10 times more. That is not an exaggeration – in one car park in Nuwara Eliya we had to pay per head, Ramanan and Chamarra were charged 20 r each but we were charged 250 r each! South Asian countries also get a bit of a discount but only about half. It is a potent reminder that being called a foreigner everywhere you go does not exactly make you feel very welcome. Which is a shame because Sri Lankans are extremely friendly people – most strangers will try to greet you, even in English. As we travel around, this dynamic often makes things awkward. People simply assume that Ramanan is a guide and not our friend. He has even been offered ‘kick backs’ for taking us to places! It is a great reminder, though, that Christians are no longer foreigners – from themselves or from God. According to Paul in Ephesians 2, all barriers are removed in Christ. I suppose that most nations like to look back to the times when they were really great… I wonder if Sri Lanka would leave the EU given the chance? Only just managed to catch up on your blogs but am very appreciative of the insights, the colour and even the wry humour which makes it easier to imagine what you are experiencing and to pray for your protection. I`m enjoying reading your blogs. The one about the wasps reminded me that some years ago a wasps nest broke through the ceiling above the baptistry, and the then caretaker. found the church full of angry wasps. He was not amused!